I need something to move me in the right direction. Anything to recharge my blogging battery. Getting through the teenage years is not for the faint of heart, or mind. It feels like a love/hate relationship most of the time. Going both ways. Though some kids seem to produce much more stress than others. Comment Verification or Word Verification. Please, pick just one. Sometimes I feel like the Gull in the photos: alone, swimming in the dark, and like the rings are life are moving around me while I just watch. Man, I'm a downer this morning! On the up side . . . Pulled Chicken sandwiches with Sweet Potato fries for dinner rocks! I have the day off. Actually I have every day off right now, which quite honestly should NOT be on the up side, but I love it anyway. I'm so appreciative for all the people who follow my blog! THANK YOU! THANK YOU! THANK YOU!!! Autumn is now officially upon us and it feels good. The Goldfinches are singing up a storm! That’s all I have for the moment. The photos you see above were taken early this morning after I dropped my daughter off at school. I hope the Gull found a little breakfast to start his day off right. Do you have any random thoughts you would like to share? Up or down! I like how you stop to take pictures of things while you're out and about. Yesterday there was a pretty butterfly on a purple flower bush in my yard and I ran to get my camera and take pictures of it, partly because I was inspired by the beautiful photos you post on your blog. If I'd had my camera with me right there like you would have I probably would have gotten better pictures. Anyway, thank you for appreciating the beauty in life and for helping others to see it as well. I'm sorry it's a hard time right now. I hope it won't last for much longer! Both very nicely photographed & I can relate to all points, but 3 teenage deaths in one year? I'm so sorry!!! It's time for me to get a haircut, so maybe that'll raise my spirit, too! I'm right there with you on the 'please pick just one'. Leaving a comment on a blog should not be sooo much work and it is hard on the hands. It's good to get that stuff out sometimes. Clear the air and start fresh. Leaves room to breath and for new things to enter in. As for myself, I feel like I'm just coasting through my job these days. I'm bored and that's the death knell in commission sales. Yet, I just don't seem to care that much. On the upside, I have a job to go to that still, somehow, some way, continues to pay my bills. I don't understand it, but it all seems to work out in the end. sorry you're not feeling well - hope the hands are better soon as well as getting a recharged battery. I'm fighting aches and pains from old "Arthur Itis" too. He's not a nice fellow. Random thought from me today, is: loving the smell of fall! Hang in there! Sorry I can't give any advice on the whole teenage thing, but I do sympathize with you! And the first day of fall in Louisville is going to be 101 degrees - go figure! Hi Sharon.....Sorry your hands are giving you trouble. I have problems with my hands, too. The pictures you shot this morning are eye catching. 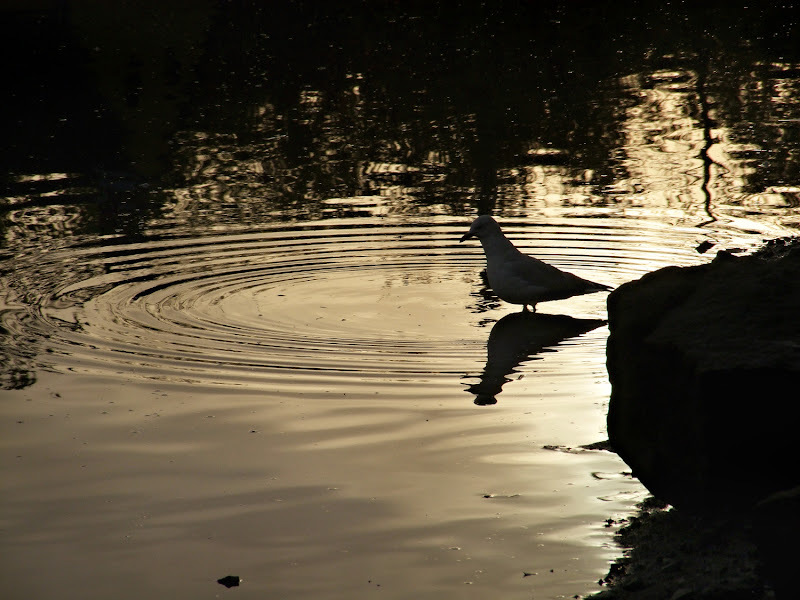 I sat here... looked and looked at the ripples. Thank you so much. I am so glad that you continue to post your beautiful pictures. Love your comments. If there's an up side, there has to be a down side too. Things have to balance. Hope your downs are only a bit below the line! and I love the images. Super. I come here often to see the pictures. Your area must be so beautiful. Have a nice weekend. I left the house early this morning to meet a classmate from seminary who is in town for a conference. Hadn't seen him for 15 years, but now that we've found each other on facebook, all sorts of things are possible! I call that an up. I have the same random thoughts and talk to myself(in my head) all day long. I often think of putting them down on paper( or computer) but know I would not have the nerve to hit that publish button. Funny because I love reading about other ppls thought on blogs. I think we're so worried about what ppl will think of me...silly huh? i hate that word verification thing too...why I got rid of mine and I've noticed many more are doing that too. So a weird chinese message comes on about E.D ...who cares? I love friends like you...you always bring me down to earth and then throw in a bit of sarcasm when I get too maudlin. Don't ever change. And please make me some of those homemade blueberry muffins! The teenage years will be long gone faster than you can imagine, so hang in there. 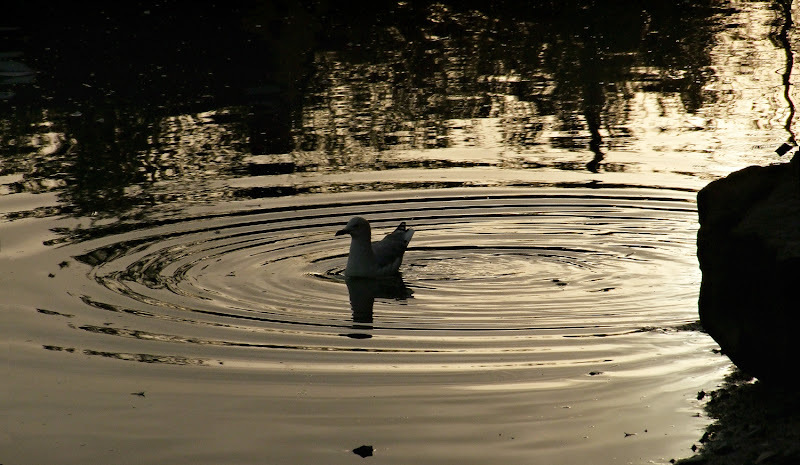 I'm seeing a gull that is at the center of the ring(s), swimming (and standing) in a pool of warm gold. Such a lovely picture from a lovely lady! Smile -- we all love you! I love the honesty of your blog. What a refreshing treat. You have such talent. Thank you so much for sharing your thoughts and photos with us. Often you speak for us all. Just love your photos - each one seems to have a story to tell - at least to me. I work in a not for profit nursing home and we post a 'thought of the month' for our residents - a beautiful picture and a short quote to fit the photo - usually seasonally. Would I be able to on occasion use one of your photos? Your photos are watermarked so I wouldn't have to type additional credits. Just wondering! And that's ALL you have? Well, that's a lot. Everybody has bad times. Am glad that you found the good in it all. But still, it's ok to vent sometimes. I'm so sorry about your pain. I like the random thoughts idea. Maybe it can be a monthly thing? Sorry you have been sadly, hope things turn around soon. Your photos are breathtaking! Love the gull shot and the blog header! would love a career change, this job is killing me. can't wait for my next vacation day. my new kitten is a love bug! I want you to know that I wait anxiously for every new post of yours. Your pictures and thoughts are beautiful and always resonate with me. You still manage to focus on the joy Sharon. :c) We all have been there. We're here to offer warm hugs and to tell you that we love you here and would SO miss you if you weren't. The beauty you add to my days is priceless to me. On the bright side, you've got a nice hair cut! I tire of hearing the excuses when the younger generation doesn't do their homework or fails an exam. I cringe when I hear some students take a class 2 or 3 times to pass it. That has got to cost some money paying for the same class 3 times! Get it right the first time! I think deep souls always feel the beauty and the sorrow of life more intensely. That depth also comes through in the poignant images you share with us. I believe that sharing such a connection in both Life's beautiful and sorrowful things keeps us whole and alive. But, from my own ups and downs, I think it also comes at a price for us artists/givers. Therefore,I think we must take particular care to nurture ourselves thoughtfully and practically. And to maintain strong boundaries against futile experiences that pull us off center or rob us of our vital energy. In my own life, I've come to believe that it's this balance between giving to others and nourishing my own flame that can keep things on track. Of course, that's particularly hard where our children are concerned. But I think we need to learn to care about ourselves as much as we care about them. Then sometimes it goes better for everybody. Hope your hand is soon feeling better! A random thought...I always look forward to visiting your blog and your beautiful pictures. That's a very good thing! We had a very cool summer in Southern California but now that fall has arrived the temp is around 105. That's not such a good thing. Sorry to hear that your hands are bothering you. With me, it's my knees. Ah, life. As always, your posts and pictures are divine. I love that photo...just perfect. How funny you did "random thoughts"..I started a regular post I will be doing off and on of the same. I don't know how often I will post it on my blog, but wanted to have more humor options than just photography and some of the other stuff I do...I posted it about a week ago, did you read it? Hopefully you get this as I am so late in commenting-I had that horrible hand aching problem 18-20 years ago. I does hurt and it seem you cannot think about anything else. My chiropractor said it was an indication that my body was not getting rid of toxins. He recommended drinking lemon water all day everyday-ONLY fresh lemon juice works for this. BUT milk thistle clears toxins from the body even better and that is what I do now when they start to ache. Hope this helps, I know your pain and it it is not fun.